Fuel-moisture at a dangerous 60 percent in Santa Barbara County. After lightning strikes spurred “several hundred” small wildfires across the state, over 9,000 firefighters are fighting 21 large fires, mostly in Northern and Central California. Although 2008 saw 2,000 lightning-sparked wildfires burning at once in the state, California Fire officials say it is “rare” for 21 fires to be burning at once. In Ventura County, the Chorro Grande Trail Fire, which started yesterday afternoon and closed Highway 33 from Lockwood Valley Road to Wheeler Gorge Visitor Center, has spread to 200 acres with over 300 firefighters and 11 air tankers in assistance. The fire continues to burn heavy bush and timber at varying elevation levels. Two campgrounds, Reyes Peak and Pine Mountain, have been evacuated. 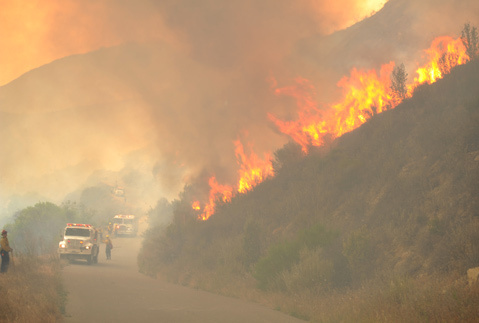 Although it is a typical summer in Santa Barbara, local firefighters stress that everyone must take special caution to prevent fire in the coming months because of the drought. Typically, Southern California sees the most fires in August, September, and October. In northern California, a Red Flag Warning is in place for windy and dry lightning storms. Currently, the state’s most severe fire is burning at 60,000 acres in Lake, Yolo, and Colusa Counties, where many residents have been evacuated.